The phrase “tremendous college athlete” rouses thoughts of football and basketball players in the minds of many. Robert Griffin III dodging defenders during a mad sprint to the end zone, C.J. McCollum sinking a game-winning three pointer from deep behind the arch – these are the stock images of superior, male, college athletes. Cheerleaders never make the sportsman hall of fame but not for sound reason. Male cheerleaders are quietly some of the most gifted jocks on campus. Cheerleading is not what most people believe it to be. Cheerleaders are much more than eye candy. The sport has undergone massive evolution since its inception. The seeds of cheerleading were planted at Princeton University. During the late nineteenth century a handful of students were so passionate about rooting for their beloved Tigers they formed the world’s first Pep Squad. These young men certainly had school spirit, but calling them athletes would be a stretch. Depiction of the earliest collegiate Cheer Squads. Photo courtesy of retronaut.co. Are they as strapping as all get-out? Certainly. Are they athletes? Not quite. 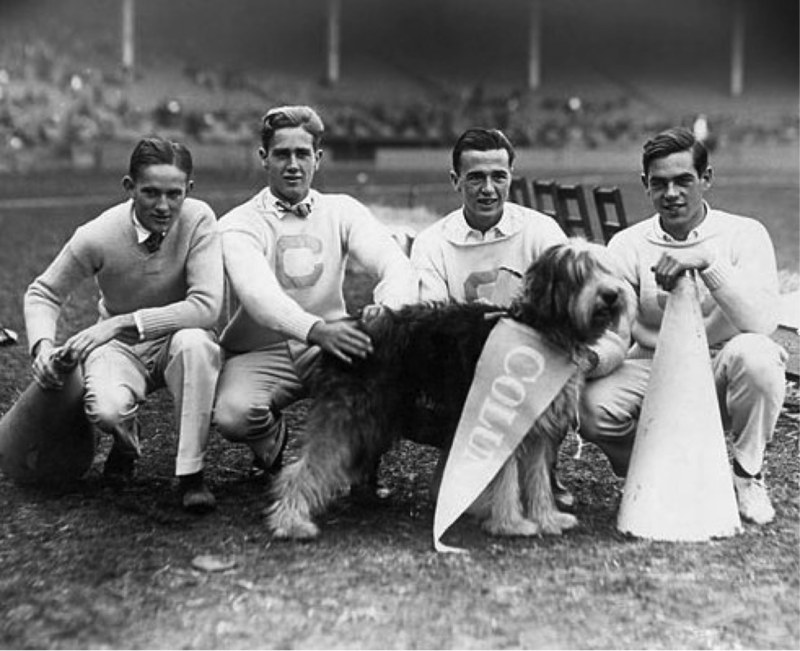 These young lads paved the way for contemporary cheerers, but in reality they did little more than yell organized chants into old fashioned megaphones and play with a sheep dog. Essentially, they were mascots without the costumes. Today’s cheerleaders are extraordinarily physical. Gymnastics, aerial acrobatics and repeated hoisting of full-grown human females are now staples of any respectable collegiate Spirit Squad. These men are no weaklings. In fact, you may mistake them for football players when they come strolling across campus. Many collegiate, male cheerleaders are former high school football players. Adam Eckelbarger has been involved with the Purdue University cheerleading program for five years and he gave TourTheTen an inside perspective on the physical challenges a male cheerer is likely to face. Being an efficient male cheerleader takes a lot more than a solid set of jazz hands. Traditionally, the best tumblers have petite bodies, allowing them to be light on their feet and execute gymnastic moves with grace. Holding adult women about your head requires great strength, obviously, and strength usually comes with size. The most accomplished male cheerleaders are the guys large enough to toss people into the air but small enough to pull off a back handspring without seeming awkward. I other words, male cheerleaders should be big enough to control other people’s bodies and small enough to control their own bodies, as well. Unlike many sports, cheering does not offer a wide range of positions. A large, stout man may be placed on the offensive line of his football team. The spindliest basketball player will be best suited for center. This is not how things play out on a Cheer Squad. In the sphere of college athletics, male cheerleaders really are the jocks of all trades. Male cheerleaders are under considerable amount of pressure, as well. Cheering is quietly, and by far, the most dangerous sport for young women. Because of the ever-increasing difficulty of routines cheerleading-related emergency room visits are six times more common than they once were, just three decades ago, according to ABC News. In 2008 alone over 30,000 girls and women visited the hospital because of injuries involving cheerleading. It is the responsibility of male cheerleaders to catch their female teammates during a toe touch basket toss. If they don’t, things could get ugly. If a running back misses a block his team might loss five yards. If a male cheerleader’s arm gives out during a one arm liberty his teammate might break her neck. Adam recognizes the dangers of cheerleading, but he is confident that the majority of accidents can be prevented with quality training. It makes sense that most people do not have a clear concept of what collegiate cheerleading actually entails. The sport is constantly changing and it receives far less attention than other athletic pursuits. The important thing to remember is that cheerleading is a sport. It has all the ingredients of a sport. This could not be said during the first several decades of cheer leading. The pioneers of cheering were spectators – little more than glorified fans. Modern cheerleading is so physical that when you attend a football game it really is like there are two sporting events happening simultaneously. There is the football game on the field and there is the cheerleading display on the sideline. Jay Harrison is a cheerleader from the University of Minnesota. I asked him about the most valuable lesson he has learned from his time on the Golden Gophers Cheering Squad. Unfortunately, many people still consider cheerleading to be a strictly feminine activity. It is considered soft. One thing all male cheerleaders have in common is a desire to change this perception. Ben Luedtke, a cheerleader at the University of Wisconsin, spoke to TourTheTen about how people view cheerleading. Male cheerleaders play the role of the unsung heroes because of this disproportionate amount of facet time. Every male cheerleader that spoke to TourtheTen loves what they do, but they all have one thing in common. They believe that male cheerleaders enjoy far less credit than they deserve. For anyone that wants a better understanding of the cheerleading world, the first thing to do is let go of preconceived notions and realize that cheerleading is a men and women coming to together to put on a great show. Cheerleading is exciting, but it is not just fun and games. Cheerleading is a definitely a sport. Mark Csernus has been a relentless fan of the written word since he penned his first action/adventure, pirate fable at age six. He holds a Bachelor’s Degree of English from Western Illinois University, where he wrote for Elements magazine and The Western Courier. Csernus currently resides in northern Illinois, continuing to nurture his passion for language and covering the Big Ten Conference with TourTheTen.com.